Pictured above is my dining room table, with the following: bowls of jambalaya and rice, almond crusted tilapia, sliced lemons for the tilapia, a garden salad, and mimosas in wine glasses. It feels like I never get to spend much time with my friends as of late, so anytime I get to spend time with them is golden. This past September, I hosted a small end of summer, party of six, lunch for my good friends. I cooked all the food and delighted attending to their every need. We ate good, gossiped and had a great time. It was my little gift to my friends to let them know I appreciate them and am so glad we get to break bread together. 1. 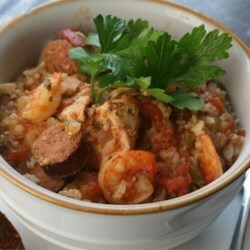 In a slow cooker, mix the chicken, sausage, tomatoes with juice, onion, green bell pepper, celery, and broth. Season with oregano, parsley, Cajun seasoning, cayenne pepper, and thyme. 2. Cover, and cook 7 to 8 hours on Low, or 3 to 4 hours on High. Stir in the shrimp during the last 30 minutes of cook time. 1. Beat the eggs with the lemon pepper and garlic pepper until blended; set aside. Stir together ground almonds with 1 cup of Parmesan cheese in a shallow dish until combined; set aside. Dust the tilapia fillets with flour, and shake off excess. Dip the tilapia in egg, then press into the almond mixture. 2. Melt butter in a large skillet over medium-high heat. 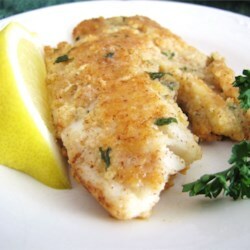 Cook tilapia in melted butter until golden brown on both sides, 2 to 3 minutes per side. Reduce heat to medium, and season fillets with salt if desired. Sprinkle the tilapia with the remaining Parmesan cheese, cover, and continue cooking until the Parmesan cheese has melted, about 5 minutes. 3. Transfer the tilapia to a serving dish, and garnish with parsley springs and lemon wedges to serve.